I've never been much of 'a smidge of this and a sprinkle of that' kind of cook. So when fourteen trays of Slow-Roasted Tomatoes began to emerge from the oven in September, I had no idea what would come next -- it was even possible that the treasure of tomato taste would remain forever lost in the deep, dark depths of the freezer. Yet I might be hooked for Steak & Tomatoes (get it?) is one of the fastest, simplest and most delicious combinations ever to make its way to my table. The tomato sauce is slightly sweet and almost smoky, the fennel fresh and pungent in the background. Paired with the beefy steak, it's well, simply amazing. Heat the oil in a heavy skillet (I used cast iron) on MEDIUM HIGH until it just begins to smoke. While it heats, season both sides of the steak with salt and pepper. Add the steak to the skillet and let cook, without moving, for two minutes. Turn the steak over, reduce the heat to MEDIUM and cook for another 5 minutes for medium rare or 6 minutes for medium (or internal temperatures of 125F and 130F respectively). Transfer steak to heated plate and tent with foil. Add the tomatoes to the skillet and cook down the liquid, breaking up the tomatoes with a spatula. When the liquid has cooked away, add the marsala and the cream and let cook down a bit again. Season to taste. Transfer sauce to heated plates. 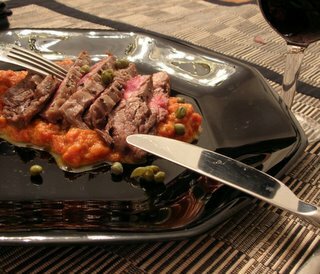 Slice steak and arrange atop the sauce. Garnish with capers. Serve and enjoy!